Surrey distillery The Gin Kitchen has launched a colour-changing expression that turns pink when mixed with tonic water. Blushing Monkey Pink Gin is initially translucent, but when mixed with tonic turns a “pearlescent pink”. The Gin Kitchen founders, Kate Gregory and Helen Muncie, said: “It’s an amethyst portal to the divine. The love child of our mischievous ‘Gutsy Monkey’ and a bashful cluster of sweet black grapes. It creates a gorgeously floral gin with a delightful sweet (but not too sweet) twist. The colour-changing expression has initially been launched in on-trade venues in Dorking, England, and will be released in the off-trade in the coming weeks. 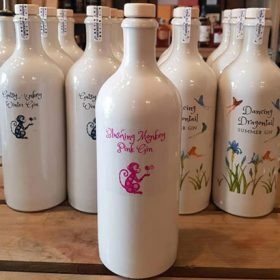 Blushing Monkey Pink Gin joins the brand’s spirits portfolio, which includes Gutsy Monkey Winter Gin, Dancing Dragontail Summer Gin and Eternal Absinthe. Dorking-based The Gin Kitchen is not the first brand to introduce an expression that changes colour. Earlier this year, Edinburgh-based Old Curiosity launched a range of expressions that change colour when mixed with tonic water.